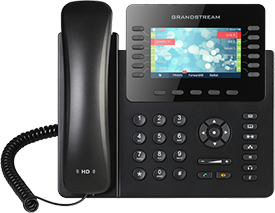 Grandstream designs and manufactures a wide range of IP phones to offer a model best suited for every business and user type. VoIP Phone offerings including Basic, Midrange and High-End options, DECT Cordless IP Phones, and IP Video Phones for Android™. These award-winning IP phones are trusted and deployed by some of the world’s largest enterprises and service providers, integrating seamlessly with nearly any VoIP service, platform or device. Grandstream is making video conferencing easier and more attainable for businesses than ever before. Grandstream solutions are easy to install, manage and use while offering the flexibility to support nearly any third-party SIP or H.323 video conferencing platform or service. 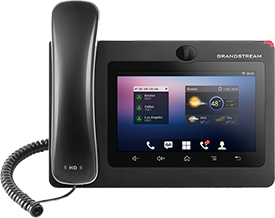 Grandstream’s video conferencing solutions include the GVC3200 series of video conferencing hardware and the GAC2500 Android™ Conference Phone. Grandstream provides a complete series of award-winning VoIP networking equipment. The UCM series of IP PBXs allows any business to easily create and manage a full network of customizable voice, video, data and mobility solutions without requiring any licensing fees. The HT series of Analog Telephone Adaptors has been deployed and recommended by the largest service providers in the world. The GXW series of VoIP Gateways enables businesses to create seamless office environments, integrate traditional phone systems into a VoIP network, and efficiently manage communication costs. 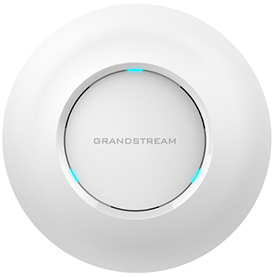 The unique and included built-in controller allows any Grandstream Access Point to provision and manage other Grandstream APs right from the AP’s web user interface. This enables setup of full WiFi networks in minutes and eliminates the need for separate controllers and software. Grandstream APs can be paired with third-party routers, future Grandstream routers and existing WiFi networks, making them ideal for any WiFi deployment.